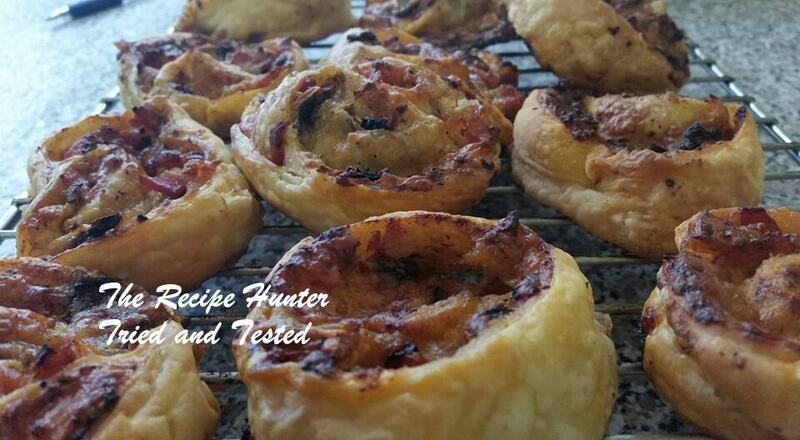 Roll out pastry on a floured surface spread with basil/tomato sauce, add grated onion, add diced bacon, mushroom and cheeses then add spices. Roll up like a swissroll tucking in the ends, cut into slices and place flat down on a baking tray sprinkled with a little flour. Bake in preheated oven at 200 C for 10 minutes then reduce the oven temperature to 160 C and bake a further 15 to 20 minutes or until the pastry has began to puff up and is crispy.